Before the use of gramophones and radio became widespread, the music sheet was the mainstay of the music industry. The explosion in popularity of parlour music in the late 19th century, with a piano becoming a fixture in the home, led to the printing of famous songs from the music hall stage. 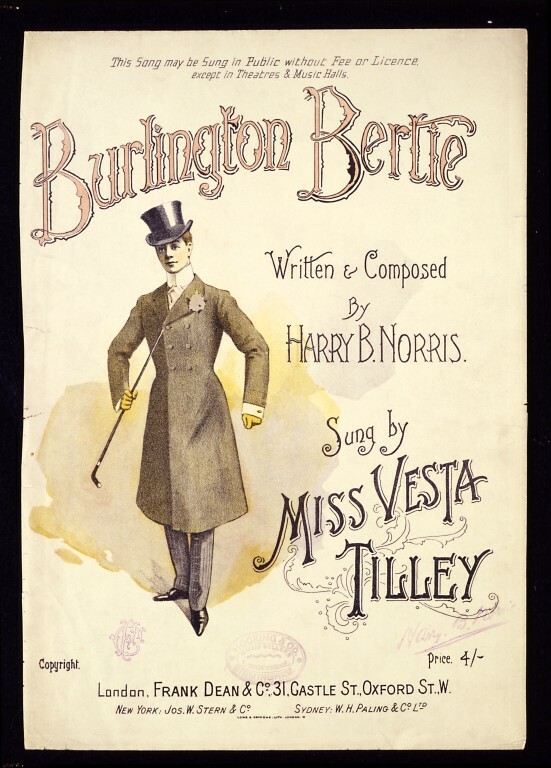 Burlington Bertie is one such song made famous by Vesta Tilley. Tilley was a male impersonator from the music halls, first wearing male clothes on stage at the age of five. She later declared that ‘I felt that I could express myself better if I were dressed as a boy’. Tilley aimed to create convincing male characters, her most famous character being the man about town – smart, middle-class, well-dressed and polite. 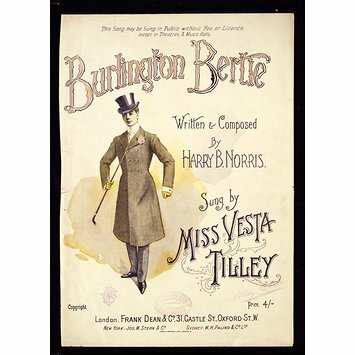 This was the character in her hit song Burlington Bertie. It tells the story of a ‘swell’ who stays out all night partying and doesn't get up till 10.30 in the morning. The character of Bertie, dressed in tattered finery, sings about how well-connected in society he is, while clearly dressed in a state of poverty. Pictorial and typographic colour lithograph, featuring Vesta Tilley in male dress holding a cane. Successful music-hall songs could make a fortune, either for writer if they still held the rights, or for a singer if they had bought the song outright. But although a performer could make a song a hit, the opposite was also true.